When you are rushing for office or running with your kids during school time a pressure cooker becomes your best friend. When you are on a hurry and need to cook,pressure cooker becomes an essentially in your life. You can’t compromise every time by eating outside and skip cooking.To cook fast and in a way so that the food retains all the nutrients and food value,pressure cooker is your best thing. If you are still in a dilemma about using pressure cooker in your kitchen due to some past experience of accident involving in it and food splattering in every possible direction then forget about it. The eminent pressure cooker brands in India are coming with their products that are more secure and safer.Prestige,Hawkins, Sunkwik and all the other brands are coming up with new and safer products.Sunkwik inner lid pressure cooker is a safer option for any user. Since you are cooking in a closed pot,the foods retain most of the nutrients and protein. When you are cooking on stove top most of the food value will get evaporated from the food.But in the case of pressure cooking most of the nutrients remain in pot. All the vitamins and minerals make the food even healthier. If you are worried about the energy waste,opt for pressure cooking.It is only way that will save a huge amount of energy. When you are cooking in an open pot heat gets wasted. But if you are cooking in closed pot with high pressure it takes lesser energy to cook. Pressure cooker ensures that you can cook in comparatively cooler and cleaner kitchen.When you are cooking in a pressure cooker,there are low chances of spilling the food and juices.On the other hand,when you are cooking in a closed pot the kitchen won’t get too much heated.As a result the kitchen remains cooler. Cook in pressure cooker. Stay healthy and stay fit. Pressure cooker is indeed one of the most important of all kitchen appliances.It helps in cooking almost every item within a very short span of time,saving both energy and time.The basic working pattern of a pressure cooker involves building up high pressure within the vessel using steam from the water added to the cooker and using this immense pressure to cook all the food ingredients within a short time span.While the working seem simple indeed,but it nonetheless important for anyone going to buy a pressure cooker to check each and every components,not just to ensure a long life of the cooker,but also to ensure safety of the one operating it. • Size / Volume – Depending upon the country you are staying in,the pressure cookers will have a definite measuring system of its volume,such as “Litres” being used in India in most cases.Before going to buy a pressure cooker,it is important that one decides on the size of the cooker one should get which will suffice the family need. • Material – The material of the cooker is highly essential.In India,aluminium cooker is still available in large quantity due to the fact that this type of cooker heats up fast and takes less time to cook.However,the effect of aluminium on the food is a debatable topic and the doubt has led to the introduction of stainless steel cookers.The more modern means of cooking such as by using induction oven required the cooking apparatus to be made of iron / steel. • Locking Mechanism – The lid locking mechanism must be checked first hand.Nothing complex is good in this department.The best lid will be the one with the simplest locking system. The inner lid is one of the most preferred choices because of the simplicity and the slim look,chances of the lid blowing up or the steam leaking from the side. Sunkwick inner lid pressure cooker is pretty common in India. 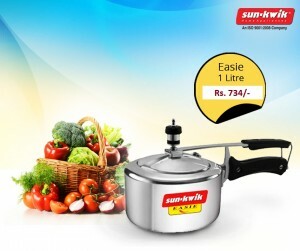 One can even order a Sunkwik inner lid pressure cooker at amazingly low rate from the online stores. The SunKwik inner lid pressure cooker is one such attribute in the world of modern pressure cooker models that has really added great ease to the kitchen activities. India has gained great repute in manufacturing kitchen appliances and the best part is that the equipments are offered at really affordable prices. The appliances are made maintaining high quality standards. They have great looks, high level safety and reasonable prices. 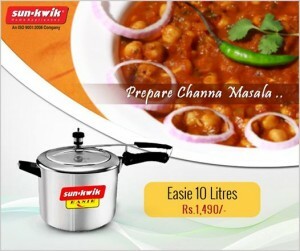 Sunkwik is one of the famed brands in the world of pressure cookers bearing world class standards. The Sunkwik inner lid pressure cooker is one of the must-haves in all household. There are several brands who often claim to provide the best in class but often fail to offer a competitive quality even. These cookers often lack in safety features and that can put forth a great deal of hazard to the life of the individual handling the cooker. The quality parameters are not met often as the manufacturers neglect to comply with the prescribed technology and tend to go for uncertified and outdated methodologies while producing the cookers. Pressure cooker is a device that locks both taste and health in a food. If your cooker is made of stainless steel then the outcome is far healthier. If one is having food cooked in a cooker then it even helps in controlling your weight as the contemporary design of cookers facilitates cooking with very little oil and fat or just without it at all. Steaming is the main methodology used in pressure cooking and that’s the best part about it. Steaming never uses the vital elements in the food and also keeps the healthy ingredients locked in the food. You get to have the true taste and the perfect flavour in this form of cooking. 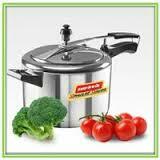 Pressure cookers are exported all over the world and they are best in class. There are various forms of cookers available in the market and Sunkwik has various forms of cookers available with it. The sunkwik inner lid pressure cooker, outer lid pressure cooker, aluminium cooker, stainless steel cooker are some of the trusted forms from the brand. They are available in different sizes so that one can get one according to their family need.